This plush microfiber sponge is a high quality tool that consists of a dense sponge on the inside, and a thick microfiber material on the outside. This covering not only adds to the absorbency of the sponge, but it also increases it's cleaning power as well. Use this sponge for general cleaning, washing dishes, auto detailing, wax application, as a kitchen sponge, a facial exfoliator, cleaning aquariums, washing your car or boat, and more. It is great for hand washing vehicles, or cleaning fingerprints and smudges off chrome and stainless steel. Achieve a true professional level of wash quality without the use of harsh chemicals because the advanced hsell material will do most of the cleaning for you. The super durable sponge interior resists tearing and shredding, and the microfiber cover holds an amazing amount of wash solution to scrub and condition your car, or whatever else you may be cleaning. It will never scratch anything, and is completely safe for delicate or coated surfaces. 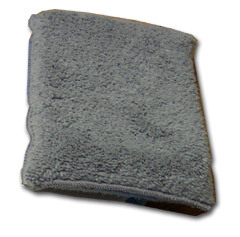 This microfiber sponge is constructed of the highest quality microfiber and is unmatched for cleaning. Get a streak-free shine with only water as a detergent. Remove dust, dirt, grease, dried on stains, road grime, fingerprints and more, without harming any surface. Save time and money when you clean with microfiber. The microfiber shell on this sponge is made from a revolutionary thread, comprised of wedge-shaped polyester filaments and a core of nylon. Made of both oil-attracting and water-attracting polymers, the fibers are woven into masses of tiny hooks & loops. The edges of these millions of hooks & loops cut through dried-in stains, attracting and absorbing dirt and micro particles, yet are so fine they will never leave a scratch. This tool is made from the highest quality materials so it will trap grease and grime and wipe it away in order to leave surfaces clean, streak free and polished. Use this microfiber sponge dry for dusting, polishing and absorbing liquid or get it damp with water or some sort of cleanser to deep clean any surface. It is perfect for kitchens, bathrooms, washing cars and more. Clean everything faster and easier when you use microfiber. This microfiber sponge is not treated with chemicals. It is the unique weave of the microfiber that gives this sponge it's superior cleaning ability. The fiber's wedge shaped filaments follow surfaces, lift up dirt, trap particles inside the fiber, and eliminate the need for harmful cleansers. The capillary effect between the filaments and nylon core creates a high absorbency, which in turn enables this microfiber sponge to clean and polish at the same time. It is great for washing dishes, facial exfoliation, removing make-up, cleaning spills, wiping counters, washing cars, boats and trucks, cleaning the bathroom and more. Get Yours Today! Uses cleaning, scrubbing, wax application, cleaning spills, etc. Dimensions (l x w) 5.25" x 6"
Microfiber Sponge - Specially designed for cleaning surfaces all over. Great for your car, boat, truck, in the kitchen or bathroom and more. Wash everything faster and easier with microfiber. Won't Scratch any Surface! Machine washable hundreds of times. Order Yours Today! This sponge works great! Best microfiber ever. I actually use it as the final wipe down after using Quick n Brite. Sometimes I have a hard time getting the Quick n Brite to fully rinse off so I use this sponge after and it leaves zero residues. I even use it to wipe the mirror and as long as it has no soap in it, it will leave so streaks. Don't both buying any other microfibers. great for wiping spills, wiping off, dishes, etc.